At the age of 103, Jim Downing is the second oldest Pearl Harbor survivor and he was the sixth Navigator who was discipled by Navigator founder Dawson Trotman. Here is part of his story (and the secret to his longevity!) taken from his new book The Other Side of Infamy. On the morning of the Pearl Harbor attack, I witnessed shocking treachery, devastation, and death. I will never forget it. But there is another side to infamy, one I have known since the moment I said a prayer in a gun turret aboard the USS West Virginia on April 8, 1935—the joy and peace I find in Jesus Christ. The Bible tells us that the Lord is more than adequate for any problem we face: “God is our refuge and strength, a very present help in trouble” (Psalm 46:1 esv). I truly understood this for the first time at Pearl Harbor, when I thought a nearby ship, the USS Neosho, was about to explode. Once I put the matter in God’s hands, my worries ceased and were replaced by an amazing sense of peace. “I’ll see you in a minute,” I told God. God saw fit to put off the time when I would see Him face-to-face. The truth is that these last few years in my 100s have been the best of my life! I have so much fun that I don’t look back at yesterday or forward to tomorrow. I live in the present, one day at a time—eager to do the work God has called me to today. Jim is frequently on the move, speaking to students, the military, or cutting a very important piece of cake! 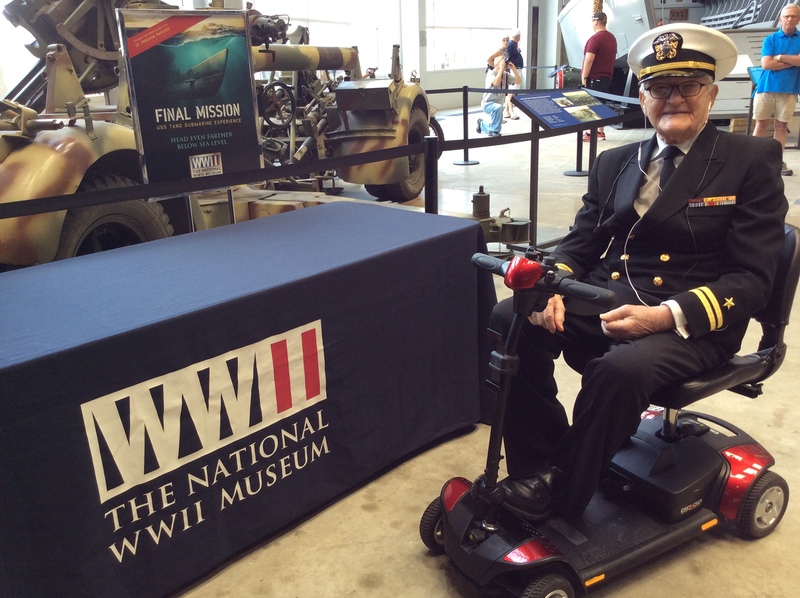 This summer he traveled with other veterans to visit the National World War II Museum in New Orleans. The trip was sponsored by the Gary Sinise Foundation and part of the Soaring Valor program- designed to provide the Greatest Generation heroes with a journey to the museum and document their oral histories on video for future generations to learn from. 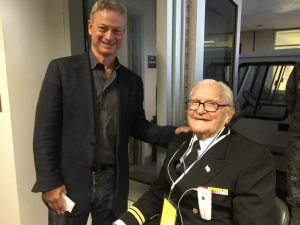 This fall Jim met with actor, musician, and philanthropist Gary Sinise. Gary even led an auditorium full of concert goers in singing Jim a Happy 103rd birthday! Watch the video. 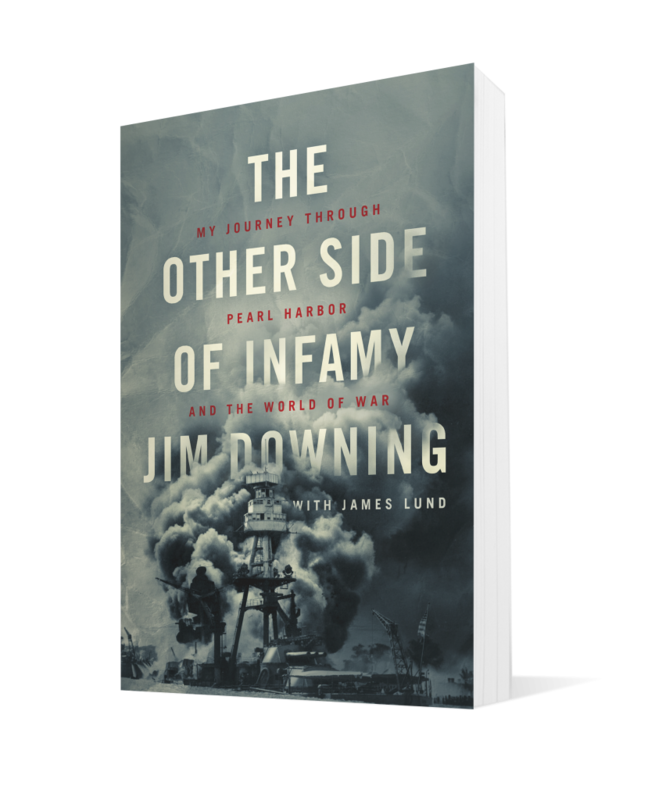 The Other Side of Infamy is a stirring memoir of Downing’s military career, including the Pearl Harbor attack, and his tenure as captain of the USS Patapsco. 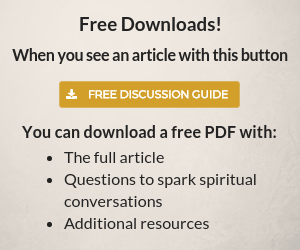 It is now available in conjunction with the celebration of Veteran’s Day and the commemoration of the seventy-fifth anniversary of the attack on Pearl Harbor on December 7th.